For some reason the scroll right and left arrows have disappeared from the youtube app when using my mouse. I've tried installing the app again but no luck. I must admit I do not recall there ever being arrows on the screen to indicate scroll direction, I have always used the left and right arrow buttons on my remote to scroll back and forth. What model TV & version of YouTube do you have? Hi I have the exact same issue. surprising that there is not much about it online! I have the magic remote which only has the vertical scroll wheel. and it bugs me everytime I want to scroll left or right in youtube and miss a lot of the search results. 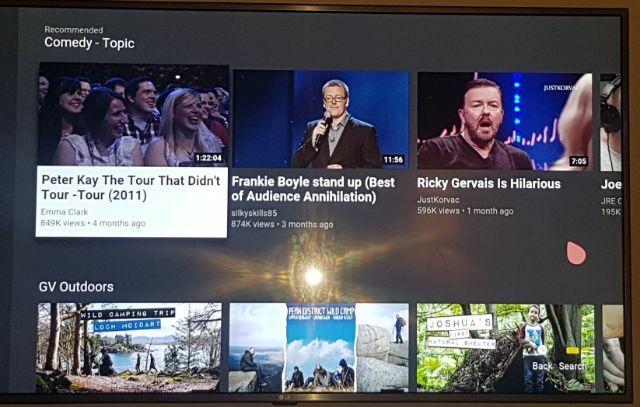 in the photo posted by the OP how do you scroll to the videos on the right of the Rick Gervais video? pic of my remote also attached.